Categories: Divine Names, Kshetra, Pandharpur, Panduranga, Panduranga Bhaktas, Spirituality. 2. Who is Namadev’s foster daughter? 3. What was the profession carried out by Namadev’s father? 4. Who was the person who always helped Janabai in her daily chores? 5. What happened when the young Namdev went to offer the divine prasad to Lord Panduranga? 6. 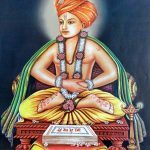 Which devotee of Lord Panduranga was a contemporary of Namdev? baked or not akin to how a potter would test if the pots are baked or not. B. Gorakumbar arranged for a grand feast and everyone ate sumptuously and fell asleep. at Gorakumbhar’s house and many thronged to witness the divine wedding. 8. Who was Namadev’s wife? 9. Who was Namdev’s Guru? 10. Why did Namdev go to find a Guru?